Last call for Bird Banter stamp set! I really like this funny stamp set called ‘Bird Banter’! I’ve made a few cards with this set already and I will share a few with you today and over the rest of the week. But remember it will be discontinued after May 31! So if you were thinking of getting it, don’t wait! I used the watercolor pencils to color these two cards. Here’s one more! It’s one of my favorite! I used the stampin’ blends markers to color the parrot. 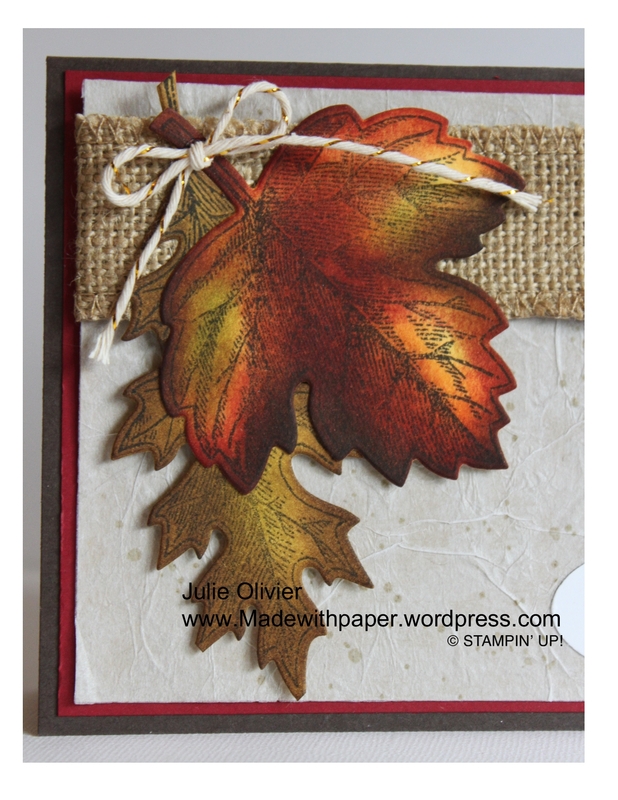 In the background, I used the Layered Leaves embossing folder. The “Rolling Marbles Technique” creates a “funky” background! I have a really cool technique for you today! I hope you’ll give it a try! I used marbles (the kind we used to have when we were young!) to create this cool background. (I have the instructions for you below.) This is perfect to try with children too, as it’s very easy and not too messy! I’ve used a few new products from the 2015-2016 Catalogue on this card. First, you might notice the Wood word “Thanks”. 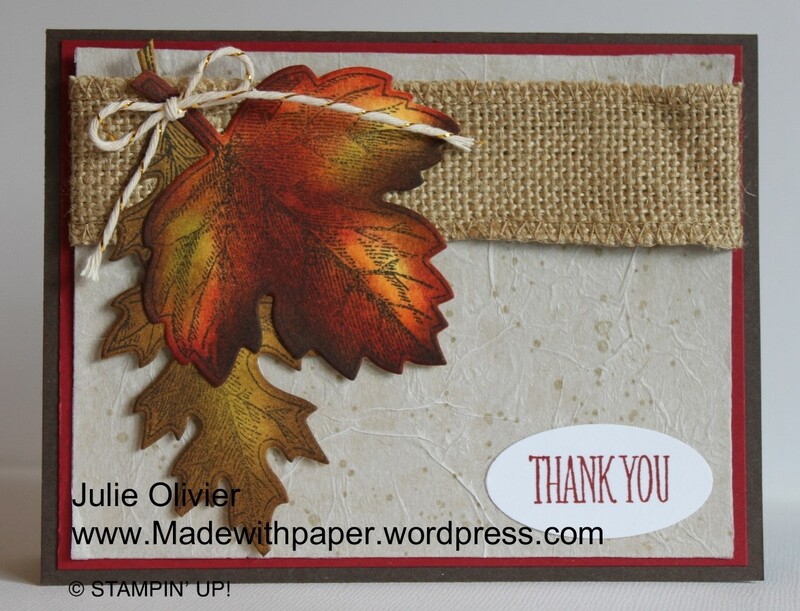 This is from the new Expressions Natural Elements embellishments. It really adds an extra something to your card or project! Also, I used the new “Elegant Dots” embossing folder on the Crush Curry chevron banner. 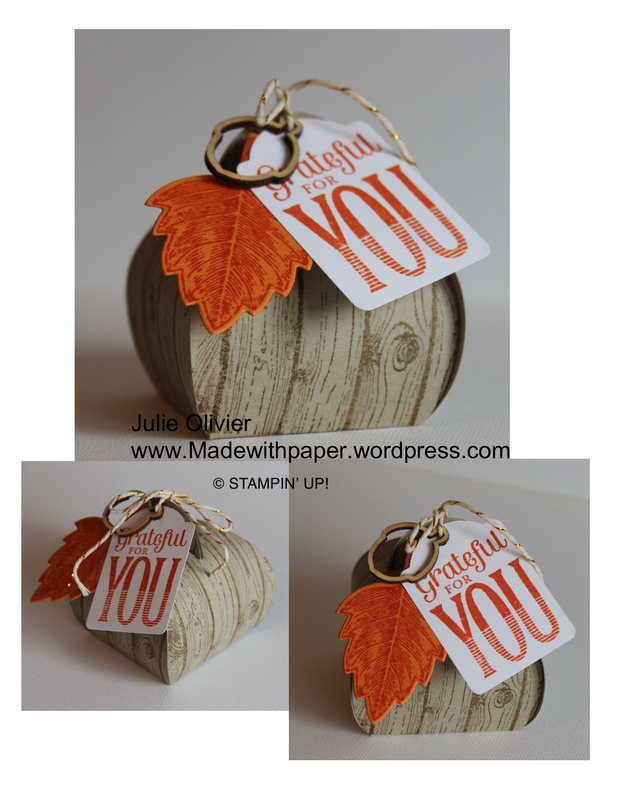 I used the stamp from “You’ve Got this” stamp set to add some texture on my Melon Mambo circle at the back. Take an empty plastic box (like a plastic stamp case). Add a few drops of ink (only one color) at the bottom. Add 2-4 marbles and roll in the ink to cover your marbles. Turn the box over and have your marbles roll all over the card stock. Remove your card stock. Repeat the same steps with a different color. Note: It’s better to do one color at a time, otherwise they will mix up together and will become “one” undefined color. 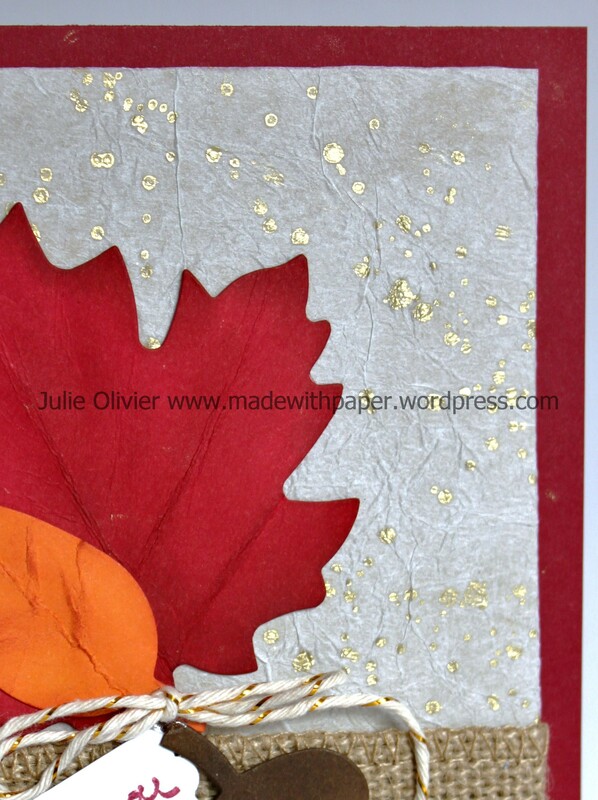 Cool Background: Handmade paper look! 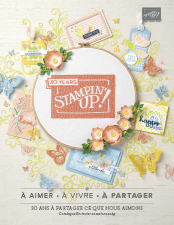 There’s only 2 days left to register to my Stamping club night on Monday, September 22, at 7:00pm. If you want to learn cool new techniques, this class is for you! For this month, as one of the technique, we will learn how to create a fabulous “handmade paper look”! This technique is so easy and does not required any expensive paper! If you’re interested, please register by September 19 at julie_Olivier@hotmail.com. 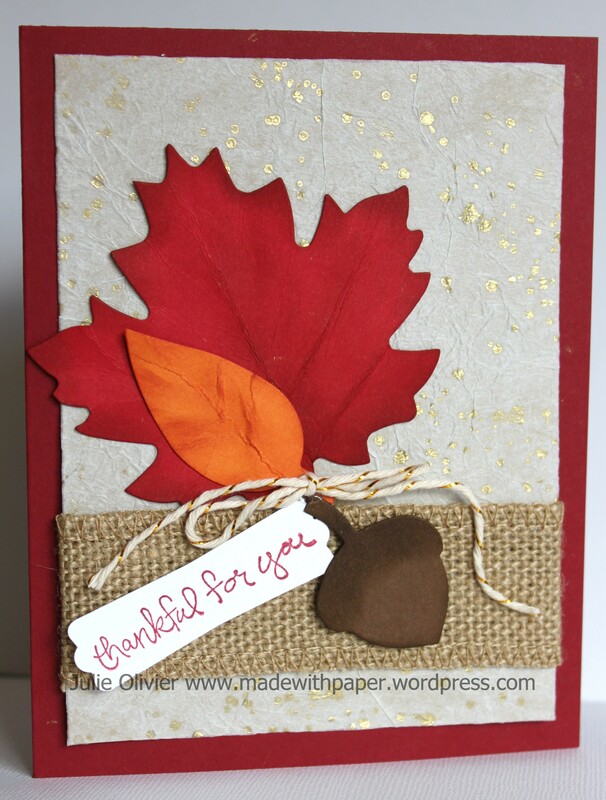 The leaves were cut with the Autumn Accents Bigz dies and sponges with Cherry Cobbler ink. The greeting is from “Good Greetings” stamp set, a set that you can earn for FREE if you host your own workshop during the month of September or October. Contact me if you are interested in booking your card workshop! I won’t tell you how to achieve this look… You will have to come to the class on September 22!!! Hope to see you there! 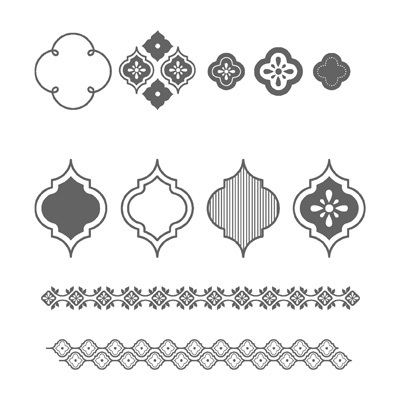 The Mosaic Madness stamp set is one of the most versatile set for me. You can make feminine, masculine and even Christmas cards with this stamp set! It’s a must have to your collection! With its matching Mosaic punch and embossing folder, it forms a great set to have! I used here the Island Indigo and Coastal Cabana color scheme. 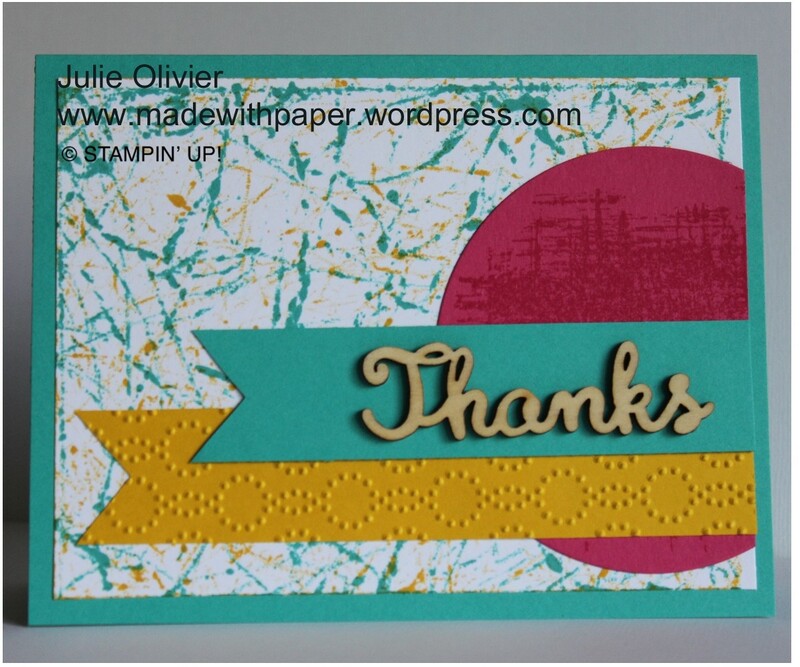 The “Thank you” is from the new “Something to Say” stamp set. 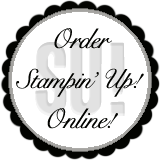 Mosaic Madness stamp set: Order yours today! Ink: Soft Sky, Island Indigo, Coastal Cabana.